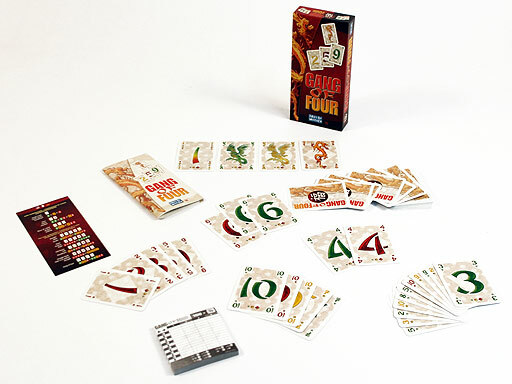 Gang of Fourâ„¢ is an exciting game of Cunning, Strategy and Power. Originating in the gambling backstreets of Hong Kong, Gang of Four is the most popular card game to emerge from Asia in decades. If you like card games, this game is for you! Our whole family loves this game. You try to get rid of your cards before anyone else. If you do bad the first few hands, don't worry. Every once in a while, the cards play just right and you can get rid of all your cards and stick every one else with most of theirs. I like the tiered scoring. As long as you only have a few cards when someone goes out, you are only penalized one point per card. The more cards you get stuck with, the point value per card goes up. You play your cards in a poker like fashion, single card, pairs, three of a kind, full house, straight, flush, etc. Other players can play on top of your play only if they can beat what has already been played. Anything can always be trumped by a "gang of four" (4 of a kind). Make sure you play all you low value cards early or you may find yourself with only a few cards that you never get to play and have to pass turn after turn because you can not beat what has already been played. A great card game of strategy for the whole family.